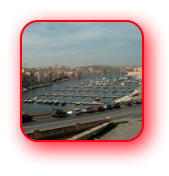 Walk 2 - Marsascala to Sliema via Vittoriosa, the Grand Harbour and Valletta. 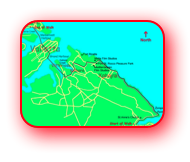 Approximate Distance 6 miles to Vittoriosa plus ½ mile across Valetta plus harbour/ferry crossings. 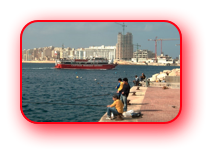 Getting to Marsaskala From St Paul’s Bay – No. 49 Bus to Valletta and No. 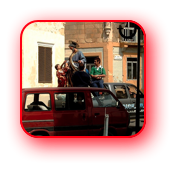 17 bus from Valletta to Marsascala. We rather liked Marsascala. 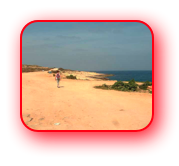 We particularly enjoyed the walk along the promenade, where we finished the Marsaxlokk/Marsascala walk, to the church – St Anne’s - which dominates the part of the town by the harbour. The church is built a little bit above the harbour level and I was fascinated to see that directly underneath it were some toilets. Sorry, but I seem to be obsessed by Maltese toilets. 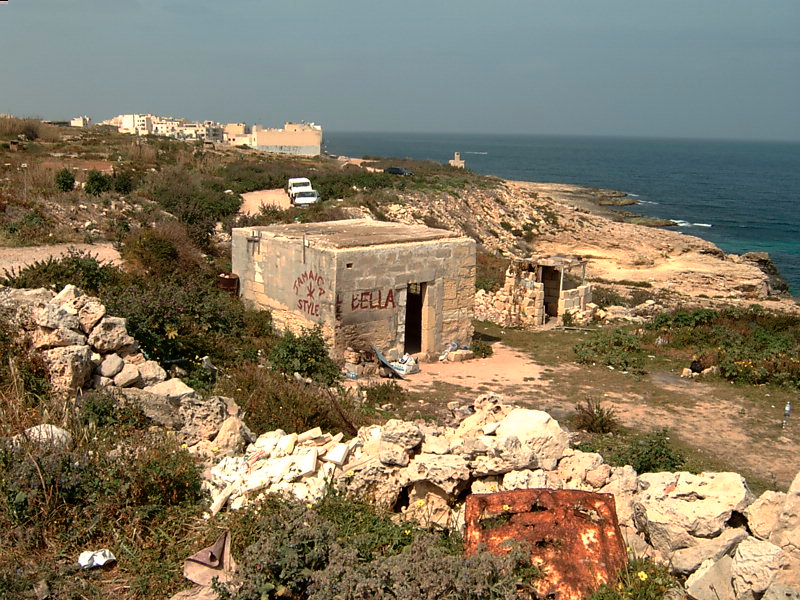 In the past many Maltese public toilets had someone looking after them who expected a payment every time they were used, but this practise now seems to be dieing out – many toilets now have big signs inside saying that the facilities are free. However, this one had a woman sat outside handing out toilet paper to those who require it, presumably in the hope of getting financial reward. The wise traveller always has some toilet paper with them for calls of nature so we did not avail ourselves of her service. As Anne said, “I would not want to use any that she’d been mauling”. Malta certainly seems to have strange practises regarding public toilets. However, we did note during this year’s visit to Rabat that the lady – who always had a little dog with her – who “looked after” the ladies loo outside Mdina was missing. We had seen her on previous visits stretching back to 1999. Presumably the sign inside stating that the use of the loos was free had had an impact, or had she retired? 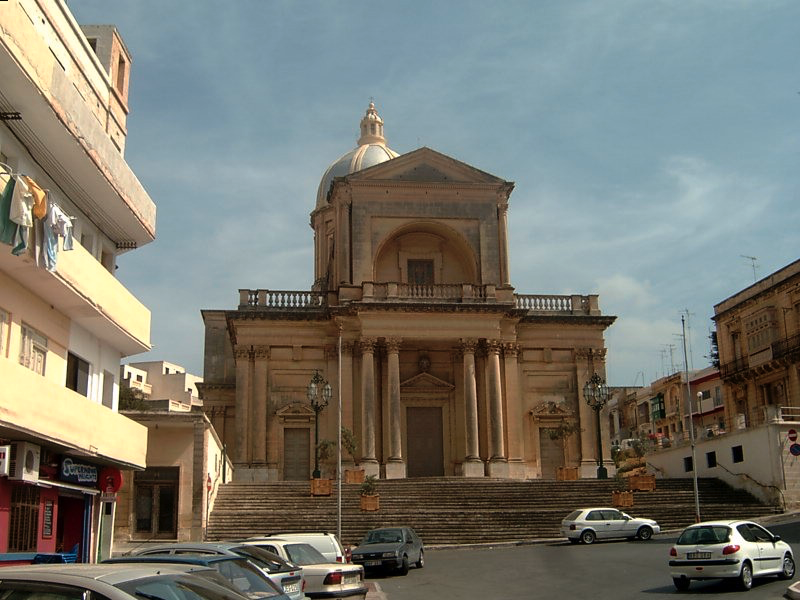 St. Anne's Church in Marsascala. 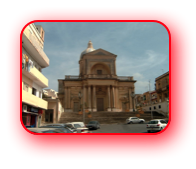 From the church we walked eastwards on the north side of the bay. 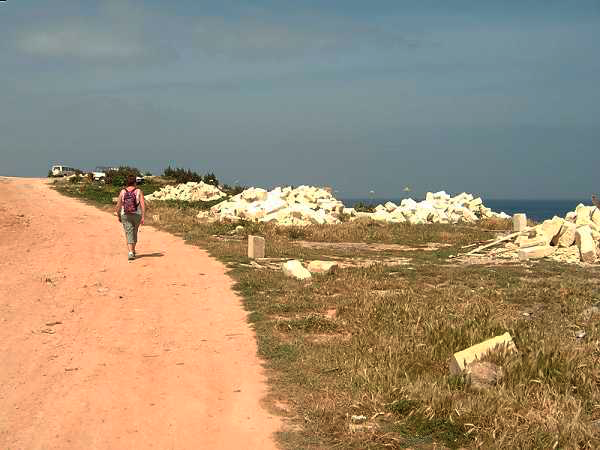 We took the path that went between some buildings and the sea, rather than directly along the road, but our path soon met up with the road again. It was just where this path and road met that we watched a “local” feeding bread to the fish. The sea was crystal clear and the fish were easy to see as we watched them attack and devour the bread. We continued along the roadside path until we reached Zonqor Point and yet another toilet, but without any eager toilet attendant. At Zonqor Point we started northwards (or north west to be more exact) up the coast on a very broad track. 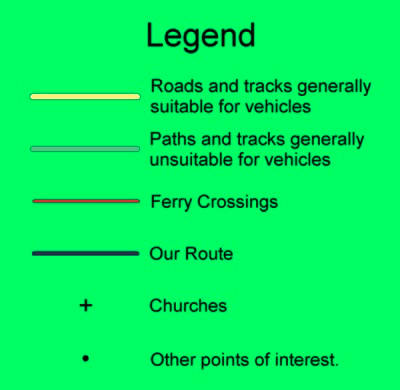 Although the track might have had detrimental impact on a vehicles suspension the track was, in parts, wide enough to take 5 vehicles side by side and vehicles had obviously used it. Along the route there were signs stating "no BBQ’s", however I think a bigger concern was illegal tipping. 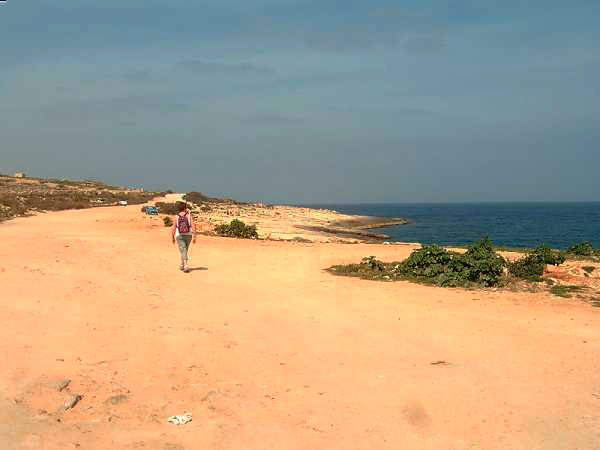 Leaving Marsascala (Zonqor Point). The track ahead was wide and not too undulating. Seems as if the track is a favourite area for dumping. The limestone blocks on the right would easily be enough for a birdman's hut. Further along the track to Xghajra. Note the bird tables on the left. 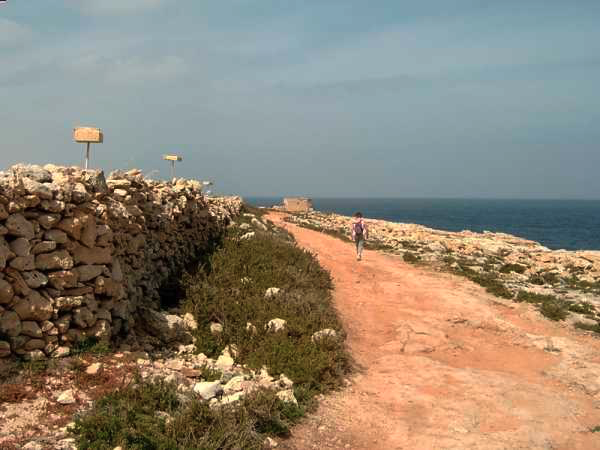 Yes, you could easily build a hut, or larger property, with the amount of building materials left on the side of the track between Marsascala and Xghjra. The area was littered with rubbish, particularly unwanted building materials. There were areas with large limestone blocks dumped on them. So many that they could easily have been sufficient to build a “Birdman’s Hut”, or even something bigger. This was very easy walking. 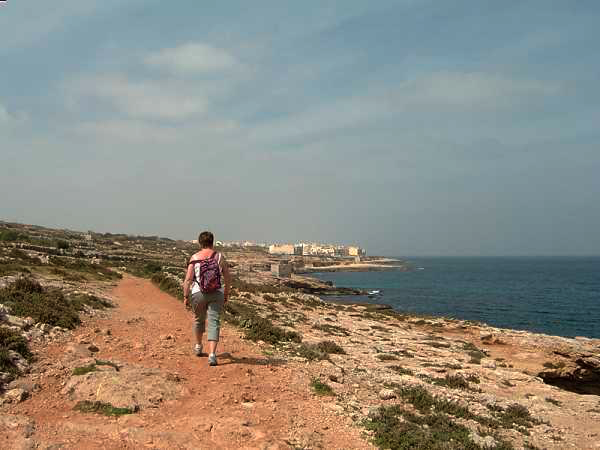 Unlike the walk to Marsaskala this track was less undulating, being just above sea level for most of the route. We met no one and just followed the obvious route and headed for Xghajra, which we reached in less than an hour. Xghajra is obviously a potential holiday resort. Like St Thomas its outskirts were a bit grim but, as we neared its centre, it became more acceptable. 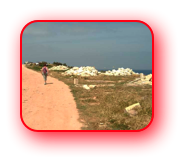 Although we did see people about - some men were fishing - it was generally very quiet and having passed the communities public conveniences we left the town and continued along the coast. 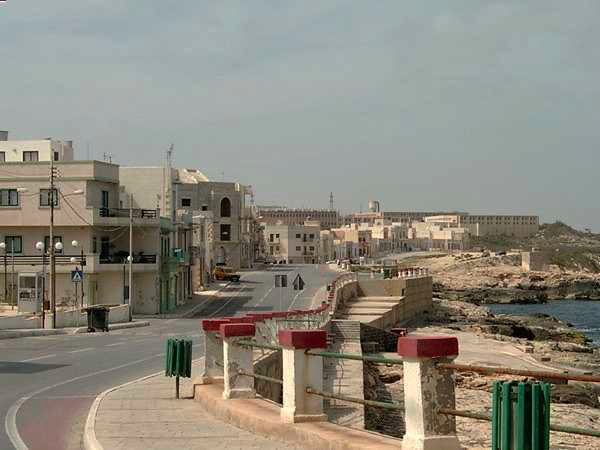 Xghajra - Looks a bit like a seaside ghost town. North of Xghajra. A very smelly location. Pheew. I don’t know what we passed but the smell was awful. I have looked on maps to see if there is a sewage works or similar along this part of the coastline but I could n't see one identified. Whatever it was, it was not pleasant. However, within not much more than ½ mile of leaving Xghajra, with the Tower at St Juliens now coming into view in the distance, our path went inland and we escaped the unpleasant odour. 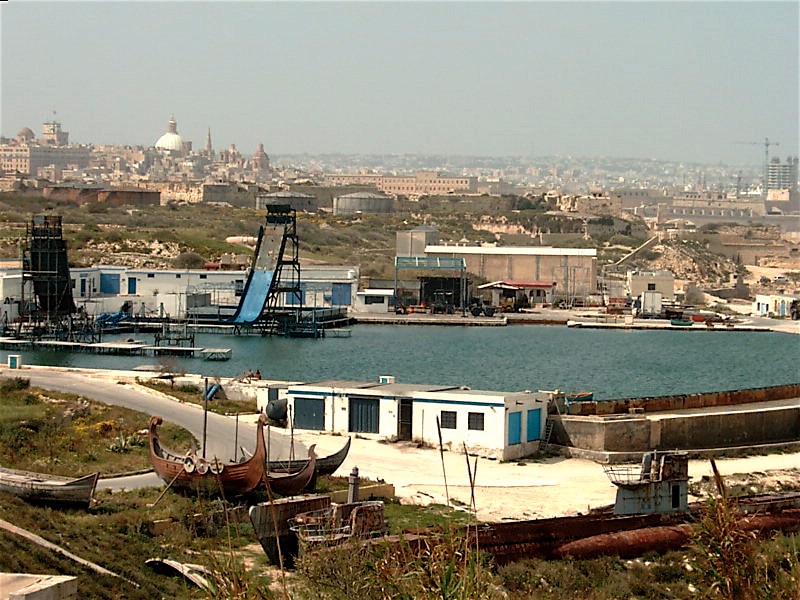 One of the big 'Ponds' at the Malta Film Studios. 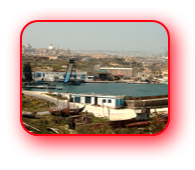 The track we followed went up hill and we could see part of the Malta Film Studios on our right – namely two big “ponds” for doing sea/water scenes on, and in. I understand this was the location for many of the watery scenes in the film Titanic. 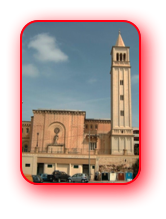 We then came to a large car park with the Fort St Rocco Pleasure Park on our left, and soon after this the crossroads by the Mediterranean Film Studios was reached. Here our route was right and within about 100 yards, at a three way junction we turned left. 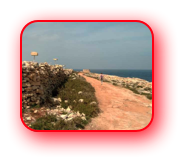 However, if you want to go to Fort Rinella, noted for its big gun, you should turn right here and follow the signs. 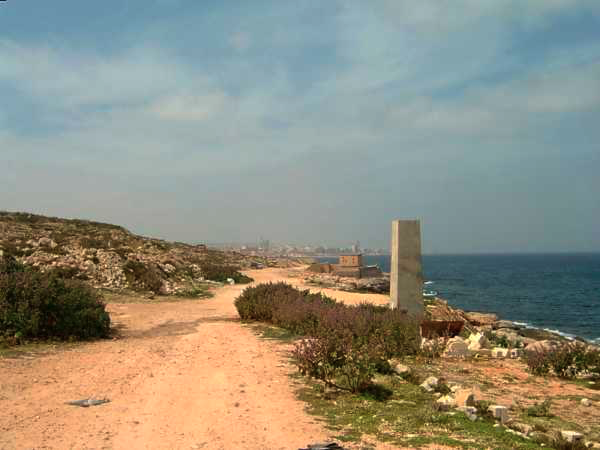 Having gone left at this junction in less than a ¼ mile we reached another junction and the outskirts of Kalkara. Here our route was right. 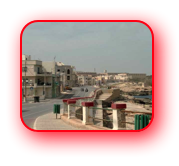 We then could have gone immediately left through a modern development to Kalkara Creek, however we preferred to walk downhill on the pavement on the right hand side of the road, and enjoy some views of Rinella Creek with Valletta beyond. 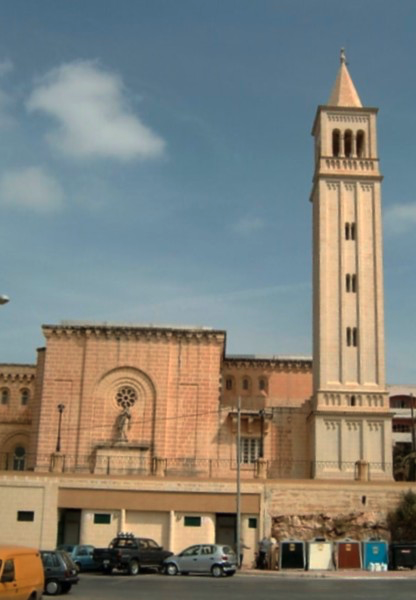 After about a ¼ mile, at a traffic island, we turned sharp left and soon were walking down a narrow street with the imposing church, at the end of Kalkara Creek, showing itself on the skyline ahead of us. Part the way down this street we came to an area on our right, like a large balcony, which gave us good views of Kalkara Creek. We also watched some local youths struggling to keep a slightly larger than life-size model of Jesus upright on the back of a pickup vehicle. A little bit of local colour. 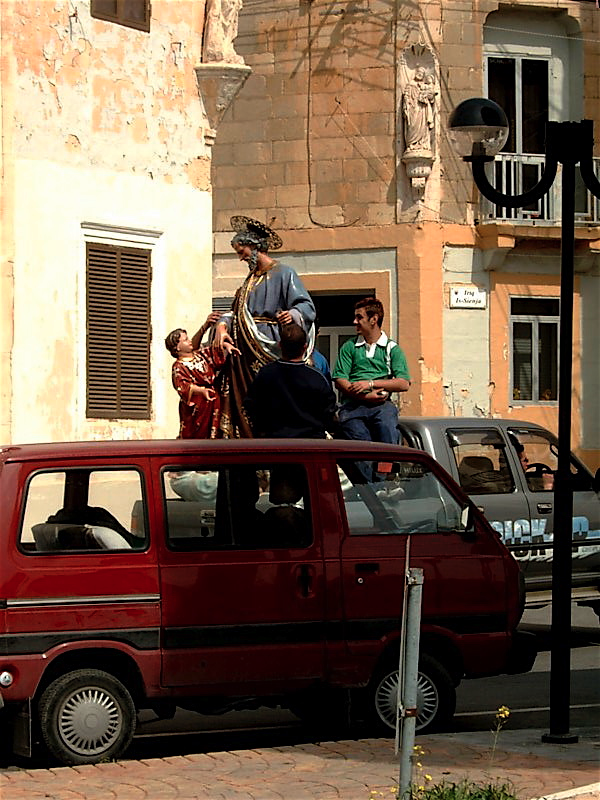 Local men about to transport "Jesus"
The street in Kalkara leading down to the Creek. 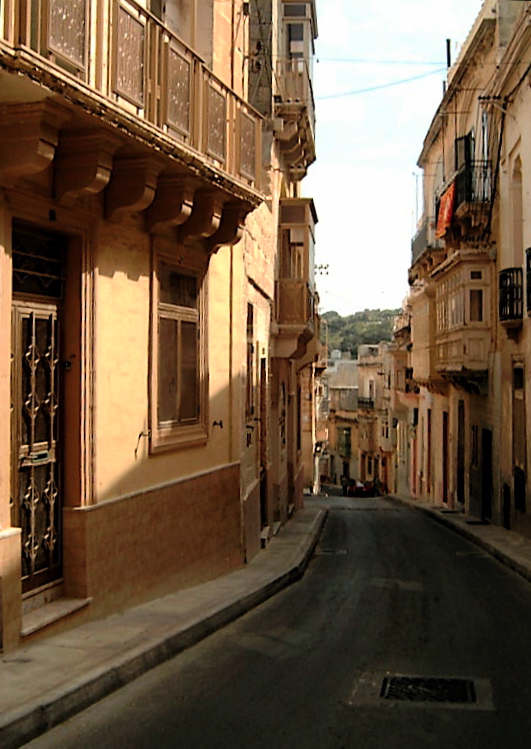 Continuing down the narrow street, which had spotlessly clean doorsteps outside every house – Saturday appeared to be the day for scrubbing the steps - we soon reached the church and, on its right, Kalkara Creek. 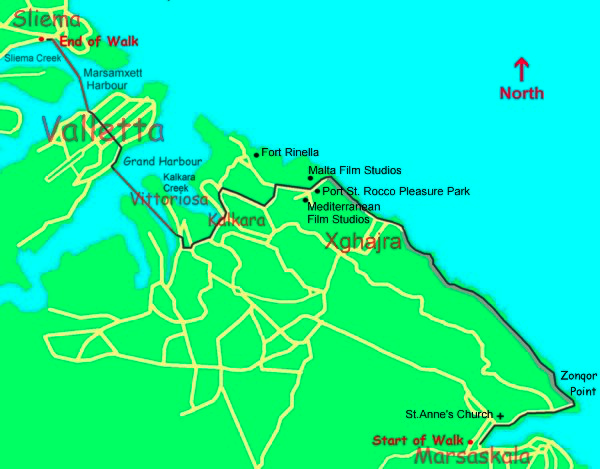 I would have liked to have spent more time in Kalkara. 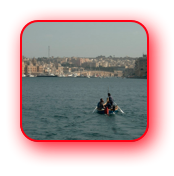 The waterfront was so unspoilt and un-touristy, but we were unsure about how we would get over the Grand Harbour to Valletta and so I spoke to a “local” who told me that my best chance of a boat would be from Vittoriosa, which he gave me the directions to get to. We walked along the end of the creek with the harbour on our right and continued in the same direction uphill past some toilets (I always consider toilets to be good reference points!) and through a large archway which spanned the road. We soon came to a junction, turned right and continued uphill stopping at a small roadside stall to buy a couple of bottles of Kinnie. We then went past some more toilets, located almost opposite a school, before reaching the brow of the hill with a bus terminal on the other side of the road (left). 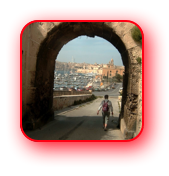 Our route then went downhill and soon we could see, to our right, Vittoriosa Harbour, which we walked down to, passing underneath another arch on the way. Looking down on the marina at Vittoriosa. 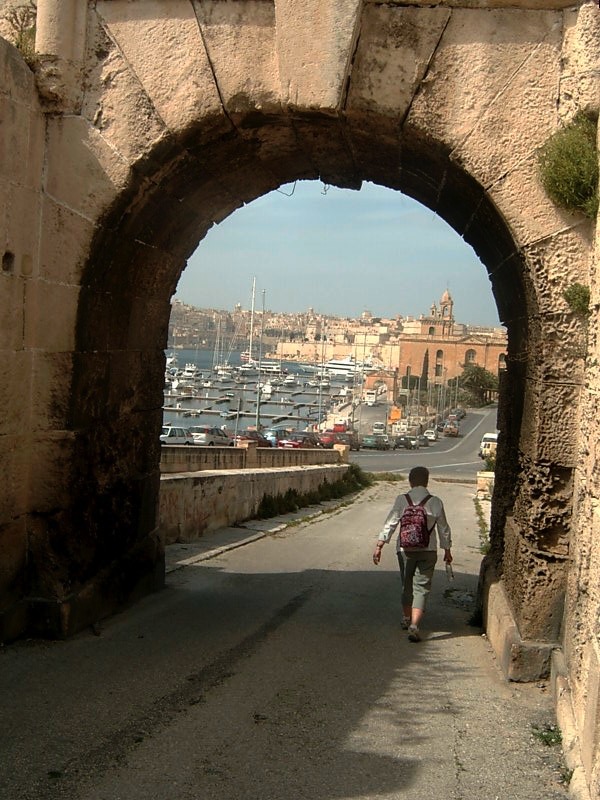 The archway entrance to the marina at Vittoriosa. 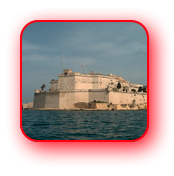 The Maltese Authorities are putting a lot of effort, time and money into improving the Three Cities and the flagship seems to be Vittoriosa. 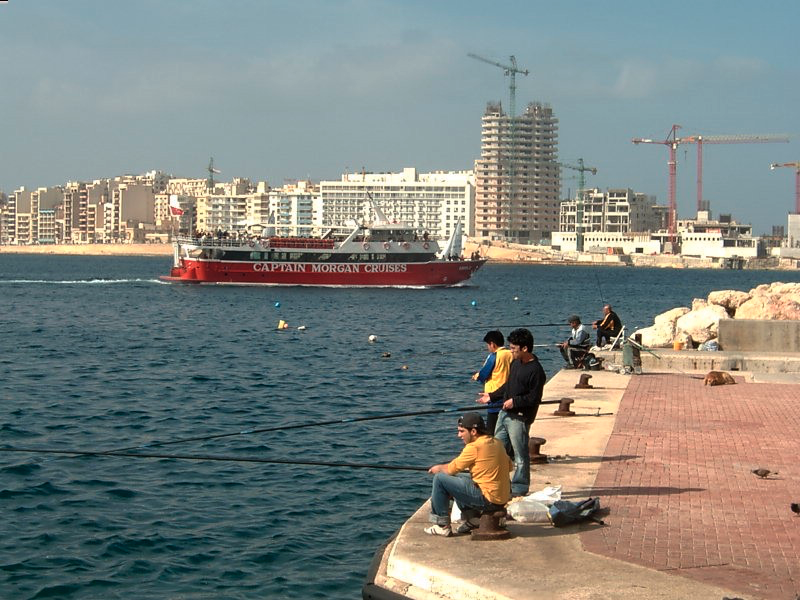 It is beginning to develop an impressive marina but, like Kalkara, and its harbour, is still generally tourist free, at least compared to the likes of Valletta, Sliema and St Julians. 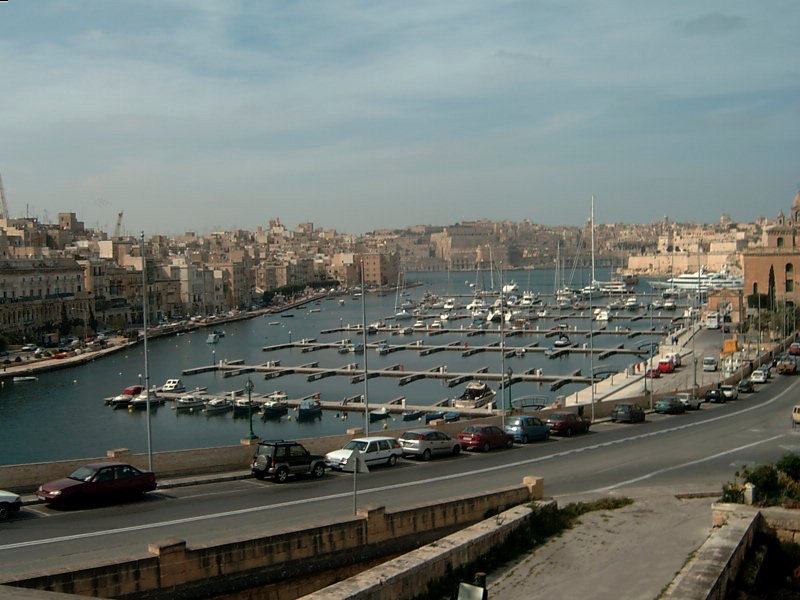 However, being tourist free meant we might have difficulty finding a vessel to take us across the Grand Harbour. But no. We were in luck. 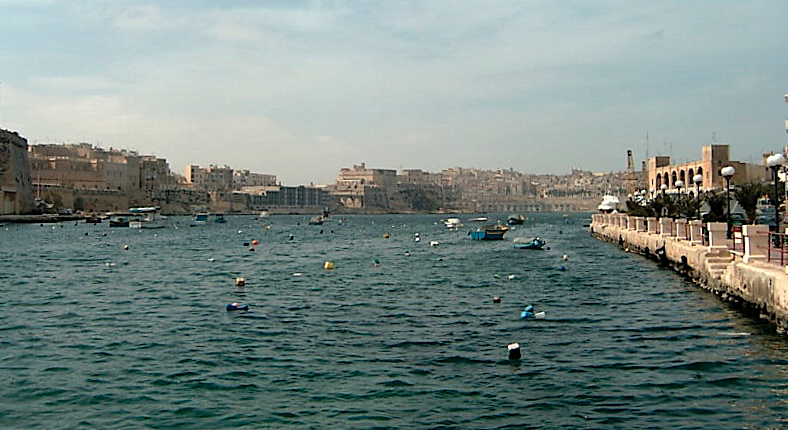 Just as we approached the Maritime Museum a suntanned local asked if we wanted a trip around the Grand Harbour. I said “No thanks, but how much would it be to get us to Valletta?” I was surprised when he said he would get us there for one Maltese Lira each. As a Maltese Lira is only a little more than £1.50 I thought this was a good price and said I would be back shortly, when we had had a little look round the harbour. Anne was a bit apprehensive. It seemed a very small boat to cross such a big harbour. Anne’s not a very good swimmer and I think she was unsure of the boat’s seaworthiness. However, she did agree to use this “ferry service” and so we joined a man and his two children who were going to have a trip around the harbour. 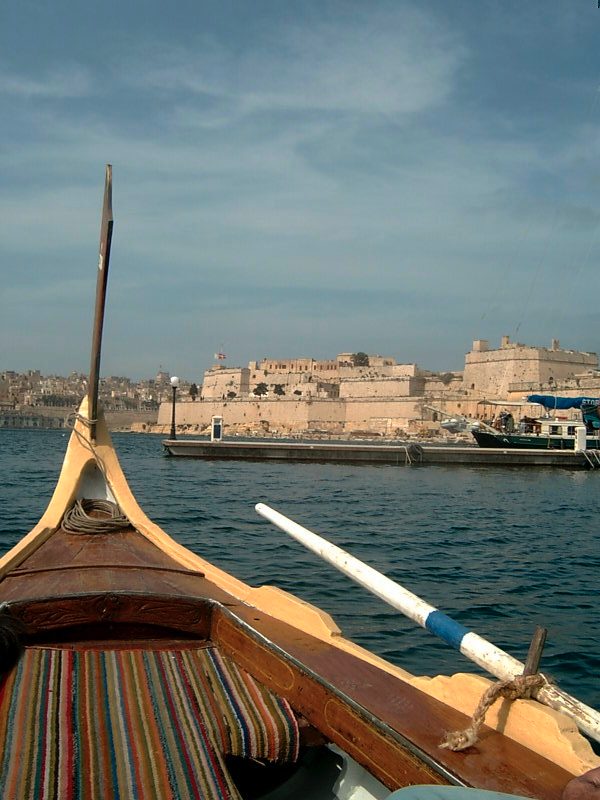 The boat in that took us over the Grand Harbour to Valletta. 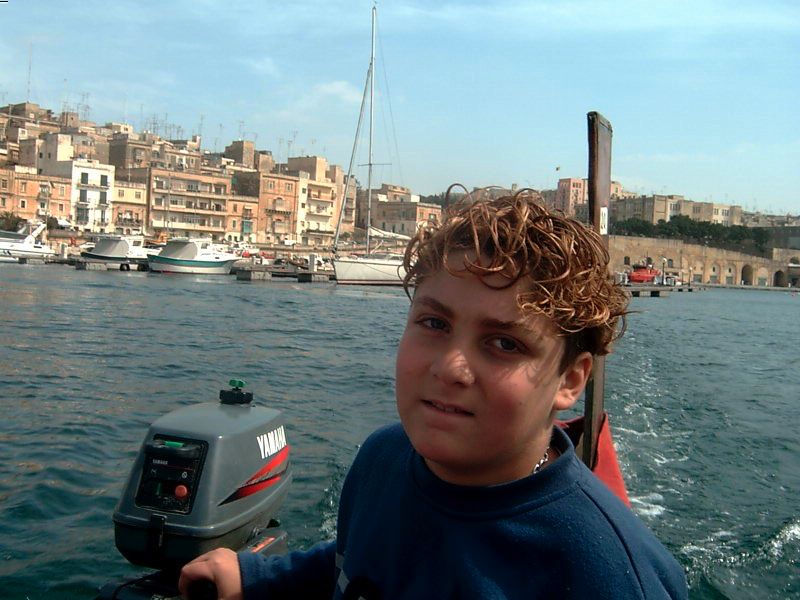 The boy who who steered the boat that took us across the Grand Harbour. We got into the boat, and sat on the seats along the sides. And then we found out that the person who would be steering us over the harbour was a young boy of no more than 10 years of age. 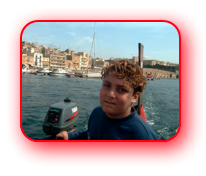 The man, who I had spoken to initially, who I presumed to be the young boy’s grandfather, sat at the front of the boat and left the work to the youngster who sat at the back with the outboard motor. The young lad was very good, although we did get a bit wet when a very fast rubber dinghy went past and we were splashed by its swell. 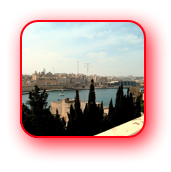 But we enjoyed it and got safely to Valletta having enjoyed some wonderful views of the Grand Harbour and the buildings surrounding this part of it. 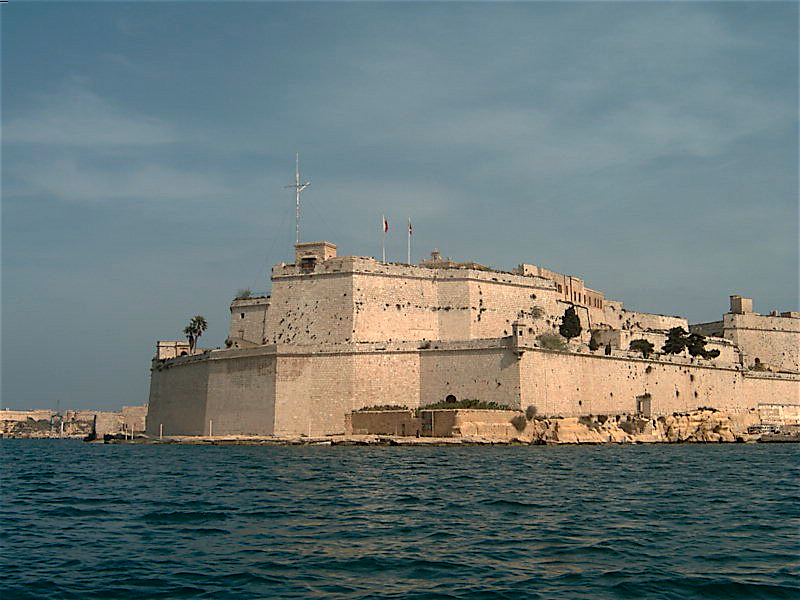 The Grand Harbour and part of one of the bastions of Senglia, which is located to the west of Vittoriosa. 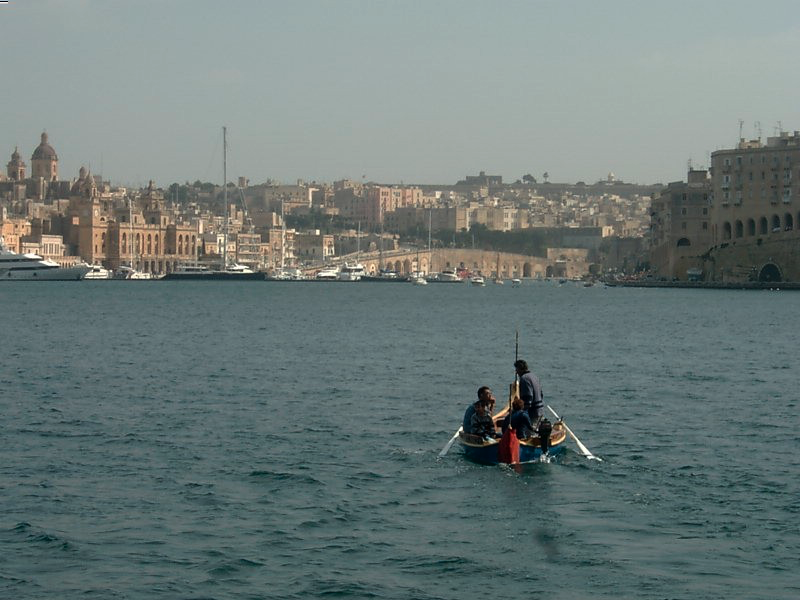 Our boat returning to the marina in Vittoriosa. 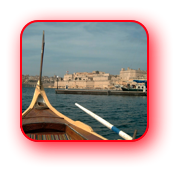 Many may feel that taking the boat across the Grand Harbour was a bit of a cheat. 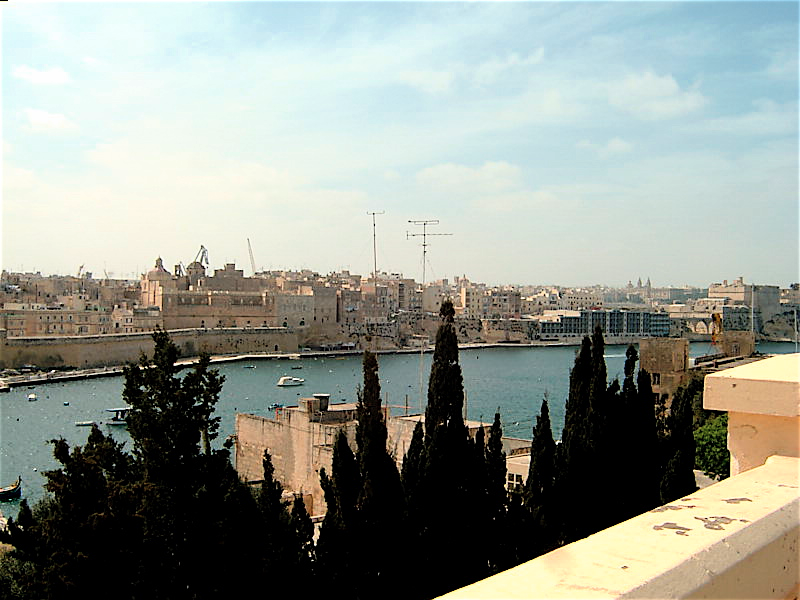 However, in November 2005 we were back in Malta and took the opportunity to walk from Vittoriosa to Valletta. The rest of the route was straight forward. 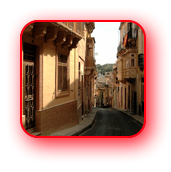 Uphill into Valletta, a stop for a drink and a bite to eat at one of the many cafes located on and around Republic Street and then downhill to get the Marsamxett Ferry, which would take us over to Sliema. Sounds from all this water travel we had been cheating on the walk. 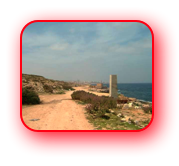 I had intended to initially walk from the Three Cities to Valletta, but every person I spoke to advised against it as we would have traversed a very busy industrial area. 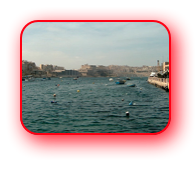 With regard to walking from Valletta to Sliema we had done this on a number of visits previously and we fancied another ferry ride. 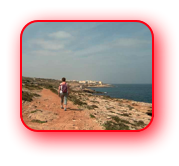 Click here for details of the walk from Valletta to Sliema and on to St Julians's. From Sliema we returned to St. Paul’s Bay on a 652 bus, which we caught at the terminal on the sea front (the Strand).